With its mix of public and private lands, the Adirondack Park provides a rich landscape for the research of natural and cultural resources. Throughout its more than a quarter-century of operation, the Adirondack Park Agency (APA) has built scientific, geographic, and planning databases to be able to serve the public more effectively and efficiently, to aid the decision-making process for other State agencies, local governments, organizations and landowners in the Park, and to encourage more research involvement within the Park by universities. Adirondack Park Land Use and Development Plan Map and State Land Map - this interactive map also includes park wetlands and designated river system areas. Would you like to become a Citizen Scientist volunteer and Help Monitor the Effects of Climate Change on Adirondack Wetlands? Visit the SUNY ESF Interpretive Center's Website to find out more. Finch-Pruyn Biological Survey, Summary of Results - Please note: This report was written by Jerry Jenkins in 2001 following a year of field work. Finch, Pruyn & Co., who owned the lands at the time, contracted with The Nature Conservancy to conduct a biological survey as part of the company’s sustainable forestry certification process. The survey included more land than has since been purchased outright or protected by conservation easement by New York State. Tract names and boundaries in the report do not always align with parcels conveyed by The Nature Conservancy to New York State between 2012 and 2016. 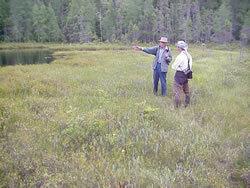 Visit the Adirondack Park Invasives Plant Program website. "Anothura troglodytes [Troglodytes troglodytes - Winter Wren]-No. 585, August 11, 1875. Rather common in the dense woods, but rarely seen ... it is often heard; however, for it possesses a gushing, ringing song, wonderfully loud for so small a creature; excepting the thrushes it is the sweetest songster in the Adirondac woods ..."
-- Teddy Roosevelt, age 16, from his pamphlet The Summer Birds of the Adirondacks in Franklin County, N.Y.